These days the range of invitations is infinite. You can get catalogs from the many wedding stationery companies that advertise in the pages of bridal magazines and on the internet. Local stationers and printers also have sample books on hand. There are also designers who handcraft invitations to meet your exact wishes. Often, this is less time consuming, since you do not spend hours poring over sample books, but simply meet with the designer and have him/her design something unique, something not found in all those sample books. The elements to consider when choosing invitations are paper shades, paper weight, fonts, size, and wording. Be sure to check costs for coordinating inserts and envelopes. If delivery time is considerable, ask if you can receive your envelopes early so that you can begin the task of addressing them. Or ask your vendor if they offer an addressing service. Allow enough time to know all your options before making a final selection. Choosing, printing, and mailing invitations must be planned well enough in advance to allow time for the invitations to be mailed and guests to respond. The rule of thumb is to allow at least six to eight weeks for printing formal invitations and their related enclosures. Plot out the time so that you will be addressing your invitations no later than two months before the wedding, and mailing them out six to eight weeks before the wedding date. The paper shades for formal and traditional wedding invitations are white or ivory. If you want something with a little more color, consider mounting the white or ivory invitation on a colored background, bringing your wedding colors into a more formal invitation. 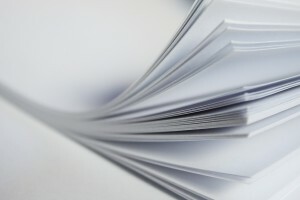 The heaviest weight paper in white or ivory may cost a bit more, but its appearance and feel are substantial and exude formality. It is correct to use either a large double sheet which is folded, or a smaller single sheet. After choosing paper color and weight, you should select your font. Pick a font that is easy to read. 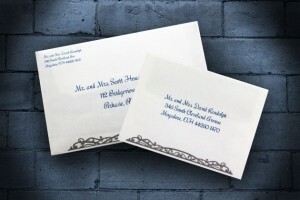 The ink color should go well with the invitation and its formality. Black ink and ivory or white are always elegant. 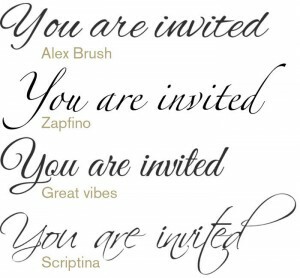 Printed invitations that do not follow the traditional, third-person wording style can be quite beautiful. If you are having a themed wedding, look for an invitation that carries out that theme. If the wedding is to be a simple celebration, the invitations may be printed on paper with a design or border. When formal invitations are written, they are traditionally inserted into two envelopes, and inner envelope and an outer envelope. The outer envelope is the one that is addressed and stamped, while the inner envelope bears only the names of the people to whom the mailing envelope is addressed. This convention serves a useful purpose – it permits the bride and groom to be very specific as to whom is invited. It is, however, correct to dispense with the inner envelope. Many brides are concerned about the cost of postage, and this allows them to lessen the weight of the invitation. A lining for your envelope adds a special touch, whether an elegant look or to match your theme. If you can afford it, you should consider this added extra.